“How To Cook Your Life” is a cheerful documentary about the art of cooking and the art of cooking your life without burning it, putting too much salt or overcooking it. Food and being determine life, and life determines food. 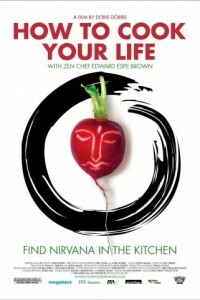 Doris Doerrie and the cooking Zen priest, Edward Brown demonstrate that eating is more than just the intake of food. Cooking is a festival of senses, and an act of love and generosity. During the summer of 2006, Doris Doerrie and her crew filmed Edward Brown at his cooking classes at the Buddhist center, Scheibbs in Austria and the two Californian Buddhist centers, the Tassajara Zen Mountain Center and the Zen Center in San Francisco, where he teaches people of all generations. His recipes are simple but rich in taste and aroma. “How To Cook Your Life” refrains from using any commentary. The camera is like a participant of the cooking courses. It captures the flour-covered wooden table, the dough, the radishes, oranges and carrots. One learns to understand the anatomy and liveliness of yeast: cakes, pizza, bread are being baked. The camera joins the lectures of Edward Brown, which are based on the ancient tradition of Zen master Dogen, the founder of the Soto Zen School. Already in 1283 Dogen wrote a cookbook in which he encourages his readers to discover Buddha in simple kitchen chores, like washing rice or kneading dough. Practical and entertaining, Edward Brown knows how to translate those philosophical thoughts into today’s zeitgeist. What is the meaning of cooking and eating for the community and the individual? Is cooking a political act? How does cooking reflect our attitude toward life and the world? “So if your left hand is anywhere near the knife, you want everything out of the way, right. So you don’t want to have the finger out like this or your thumb out like this, because the knife will find it. You think you are keeping your hands out of the way, but the knife will find anything that’s sticking out. It’s just what knives do. ” Edward Brown is a happy priest, but for sure no saint. To him, the whole world can be found in a watermelon. In his pots, rivers and mountains are cooked. Fast food restaurants, organic farmers, starving homeless people and a woman who only eats what other people discard. Doris Doerrie’s observations in San Francisco reveal a world of contradictions and diversity. 80% of all Americans don’t eat at home, neither do they cook. If you don’t know how to cook and you are poor, you have to live on cheap and bad food. No time for cooking and eating together is a loss of community and culture. To learn how to cook means to experience and preserve the richness of one’s culture and traditions. “How To Cook Your Life” can change your view on cooking, eating and your own life. You will never again cut your vegetables the way you used to.